God bless Google and all the other search engines for making the internet the amazing electronic encyclopedia that it is . Myth has it that Al Gore invented the internet. I doubt that seriously but he is credited with coining the phrase “Information Superhighway”. That’s about it. I won’t bore you with the details but in a nutshell the first idea came from Leonard Kleinrock in 1961, the internet as we know it by a group of smart guys in 1969, the first email by Ray Tomlinson in 1972 and the first WWW by Tim Berners-Lee on August 6, 1991. Personally I’d like to believe the internet was invented by two guys in their garage in California during a drunken weekend. That’s where most great things begin. Google really was invented by two guys, Larry Page and Sergey Brin and the term “to Google” is said to have started in 2004. Google truly was operated out of a friend’s garage in California and the rest, as they say, is history. Because of the internet and because of Google and other search engines like it, genealogy research has become easier, less expensive and accessible to everyone. It is no longer necessary to travel to foreign lands to see into the lives of our ancestors. Wading through all the information available however is daunting. But it is possible to hone down the hits, reducing your stress level to a minimum. Using one of my surnames as an example I put Sipe into Google. Results – 239,000. I’ll be someone’s ancestor before I could possibly get through all that. Typing Sipe and Genealogy, making sure to use the “and”, I reduce the hits to 4,150. Still too many. A little more information for Google – Sipe and Genealogy and Virginia – I reduce the hits to 4,040. Good but not great. Finally going with Sipe and Genealogy and Rockingham County and Virginia the hits come down to 612. THAT I can manage. You and I both know, most of those 612 hits will be useless to me, but in there somewhere is a gem waiting for me and me alone. With only 612 I won’t lose patience (which I am known to do) I will find that one piece of information that will put a smile on my face, maybe a tear in my eye and encourage my conviction to push on. So God bless Google and the Internet and all the people who post information online. It’s out there waiting for you. Go get it. If money were no object, I could hire a professional genealogist to do all my research and I could surround myself with ancestors. Lots of them. If money were no object, a fledgling researcher could hire me to get them started. But money is an object. A big, big object. And information on the internet usually comes with a price. Subscription sites can be extremely costly for a beginner. But with a little digging, a little good old-fashioned snooping and a little shoe leather you will make a good start before spending a lot of money. One place I always look is FamilySearch.org. Free to everyone, this website offers US Census, some English census and some obscure records that you won’t find anywhere else. I’ve even found something that wasn’t on Ancestry. Maintained by the Church of Jesus Christ Latter Day Saints in Salt Lake City, it supports a very simple search engine. You can search either an exact match or a range of matches. If you are fortunate enough to live near one of the church’s satellite libraries, call them. Find out their hours and get ready for a real treat. The volunteers are helpful and they have subscriptions to many of the payment sites like Ancestry.com and Archives.com. Each library has books, records, some magazines, microfilm readers. For a nominal fee you can rent microfilm, and other records from Salt Lake City. They will be delivered to your library and you will have a week or two to view them before they must be returned. Google is another source of free information. Put in the surname you’re looking for and push enter. You many find other people looking for the same name and they may have posted their family tree online. If you can make a connection you may find many, many generations. GenForum.com supported by Genealogy.com has an incredible selection of surname and location forums. Periodically I go into the forums, put in a surname and look to see if anyone else is looking for the same branch of the tree. I’ve connected with three fourth cousins in one line, one fourth cousin in another and one third cousin in another. Each person had tons of information and were more than willing to share. The three fourth cousins and I are all great-grandchildren of the same couple. So exciting. You do have to register, but to my knowledge it is still free. Google state, city and county sites. Many of them are involved in the national GENWEB project and have searchable records online. Each state has a variety of different searchable records. For instance the state of North Dakota directed me to the Bureau of Land Management. I got records of my grandfather’s land that he homestead. Hopefully the state you search will have many for you. All for free. Local libraries all have genealogy records in their reference section. The main library in the county will have more but each library system is different. A few regional libraries like the Orange County Public in Orlando, FL have an entire floor devoted to genealogy with rolls of census microfilm, printers interfaced with the readers, rows and rows of books. Also most libraries have agreements with out of county facilities and can get a book for you from another state even. State Universities allow access to their libraries but you have to check to see if you need to apply for a temporary card. I’ve found microfilm of early, early census, newspapers and a lot of Civil War books. Living near the University of Florida, I’ve been to their libraries many times and did my earliest census work there. Finding a parking place on campus is much harder than finding ancestors. There are other free information treasure chests but these are the ones I use the most. Of course the ultimate is a trip to Salt Lake City, but that would involve air fare, hotels, meals, rental cars, etc. That would not be free. Therefore, that is not for me. My daughter saw this on Pinterest.com and told me it reminded her of advice I had given her when she was younger. 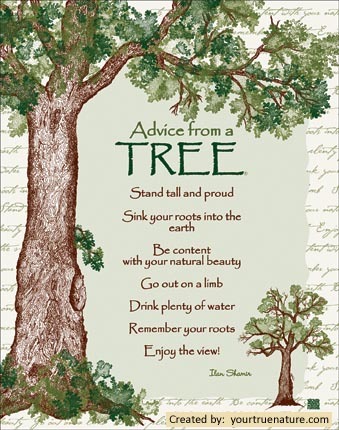 It’s called Advice From a Tree, but I like to think that it’s also advice from a family tree. Genealogy is a serious research project. No one takes the journey lightly and no one gets through it unscathed. We chew our lips, knit our brows, scream in frustration and throw our hands up in exasperation. But as we climb up and down the tree, stretch way out on the limbs and do just about anything to find data, we find humor just about everywhere we look. A friends of mine, a fellow genealogist and online buddy posted this poem on our discussion board a few years ago. She has joined her ancestors in that big LDS Library in the sky so I would like to reprint it here in her honor. For you Sissy. There’s been a change in Grandma, we’ve noticed as of late. She’s always reading history, or jotting down some date. he even has to wash the cups and dinner plates. Compiling genealogy for the Family Tree. She has not time to baby-sit, the curtains are a fright. No buttons left on Grandpa¹s shirts, the flower bed’s a sight. The only thing she does nowdays is climb that Family Tree. The mail is all for Grandma, it comes from near and far. Last week she got the proof she needs to join the DAR. A worthwhile avocation – to climb the Family Tree. Some were French as pastry, some German all the way. Who blazed the paths of wilderness and fought through thick and thin. Each time she finds a missing branch for the Family Tree. And one, alas, the records show was hopelessly a crook. One lost in time, now all recorded on the Family Tree. To some it’s just a hobby, to Grandma it’s much more. She learns the joys and heartaches of those who went before. They live again in spirit around the Family Tree. At last she’s nearly finished, and we are each exposed. Life will be the same again, this we all suppose. Grandma will cook and sew, serve crullers with our tea. We’ll have her back, just as before that wretched Family Tree. Sad to relate, the Preacher called and visited for a spell. We talked about the Gospel and other things as well. The Preacher, too, was neatly snared by Grandma and the Family Tree. Genealogy research has a nasty habit of changing long-held attitudes. My theory used to be “when in doubt, throw it out”. But that was then – and this is now. I occasionally come across a piece of information that to my eyes, just doesn’t fit anywhere. But I hang onto it long enough and eventually that piece fits into my puzzle. Perfectly. Information you find, whether online or from a cousin, acquaintance or a complete stranger should be kept, cherished and brought out every once in a while to re-examine with fresh eyes. Consider the mysterious ancestor who was in the 1910 census, unmarried and living at home in 1918 when she had a baby who was given up for adoption, and then she was gone from the 1920 census. My first guess was that she got married and moved away. And thinking that, I felt she was lost to me forever. Visiting the local LDS library one day I casually mentioned this woman and how disappointed I was that I had reached a dead-end with her. One of the volunteers immediately said, “Well maybe she died in the flu epidemic”. Flu epidemic, what flu epidemic? He proceeded to explain to me about the Spanish influenza epidemic of 1918. News to me. That gem of information got filed away in the mental data base. When I got home I immediately started searching Find-A-Grave for her name in Philadelphia. Not there. Then I just put in the surname in FAG’s search engine and BINGO. There she was. The first name was spelled slightly different, but there was an obituary in the listing naming her mother and father (which were correct) and that she died of pneumonia, a common complication of flu. A Google search about the Spanish influenza epidemic led me to discover that just short of 800 people died in Philadelphia on October 10, 1918. My poor lady was just one of the many. Thinking more kindly of them now, I’d like to think that in their grief, the family just couldn’t see their way to raise the child, and gave her up for adoption. Now I hang onto little tidbits of information, a name here, a date there. Filed away until one day to be brought out, re-examined and fit into my family puzzle. Perfectly.